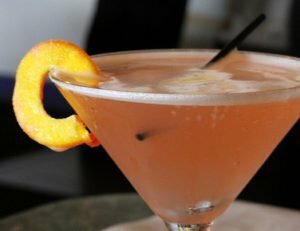 The Paradise cocktail is one of the not so known classic cocktails that has long been a favourite of many of us. Where the classic Martini is dry, the Paradise is sweet and fruity, a really nice accompaniment to summer evening dinners. Make sure you use fresh squeezed orange juice to complement the gin in the drink. As for the gin, a London dry gin like Beefeater is perfect. The Paradise Cocktail was invented by Harry Craddock and it is a pure classic. This cocktail has absolutely classic composition – gin as main alcohol, apricot brandy (actually is not a brandy, it is sweet fruit liqueur) as sweetener and freshly squeezed orange juice as compliment. Strain the drink into a chilled glass (NO ice in the cocktail glass!). The juniper from the gin mixed with orange, and a touch of apricot brandy makes this a tasty sipping cocktail. This is the neat version of the drink, but a Paradise shooter is also pretty popular.